Wow, it's been a long time since I wrote one of these! The Sengoku Basara series has been reasonably quiet over the last few months, so I've been catching up on real life (and playing lots of Final Fantasy XIV). Thank you all very much for the notes/corrections/suggestions on my Sanada Yukimura-den guide; I'll update that very soon but the comments section has a lot of great information from the community. 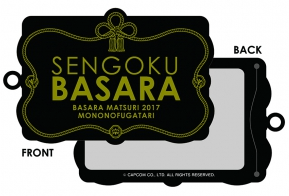 I also need to update it to reflect the changes to the DLC pricing, and the expanded availability of the mascot costumes for Benmaru and Bontenmaru which are now available for purchase. I'm going to make this news roundup less detailed than my old ones since there's a lot to get through. I never got around to announcing it at all but the big Basara Matsuri 2017 ~Mononofu Katari~ celebration is taking place this Sunday 5th February 2017 at the Maihama Amphitheater in Chiba! There will be two separate events on the same day, one at 14:00 and the other at 18:00. Tickets cost between ¥7,200 and ¥8,200 each depending on the seat. 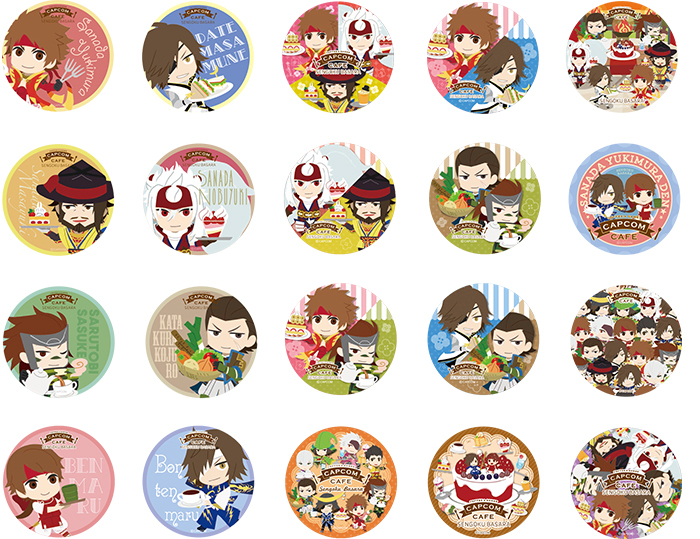 The theme of this event, which was originally revealed several months ago, is loosely a celebration of the Yukimura collaborations we had throughout 2016. 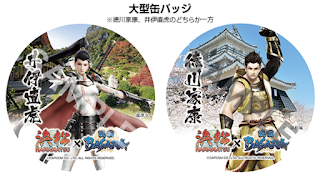 Mononofu is a fairly specific word for a brave warrior which has a very strong association with the historical Sanada Yukimura in Japan, so he's the star attraction this time. I bet Nakai Kazuya (Date Masamune) turns up as a secret guest at the end though; it happens so often now that it's no longer really a surprise! The main attraction is being advertised as live voice performances by the star-studded seiyuu cast including a special story created just for the event, and we can also expect some brand new information from KobaP. 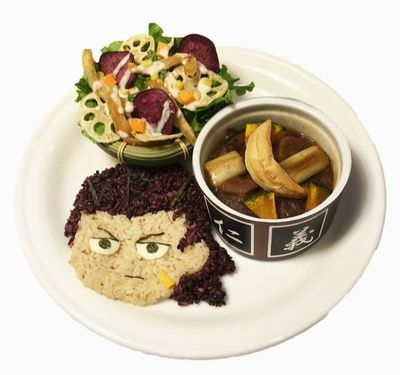 Sadly I can't attend in person this year - which is upsetting as Noto-san will be there and I would have loved to see her - so I won't be writing up a detailed report, but any announcements made at the event should receive full press coverage (and of course, attendees will be updating on social media). Given the silence since the last game was released and the lack of information from the fan meeting events late last year, I'm excited (and more than a little nervous) to learn where the series will be going in future. 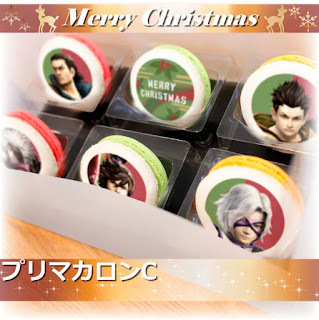 As usual, there's exclusive merchandise available at the venue for fans to scramble to obtain. They have also announced the details for the home video version of the event, and I was delighted to see that there will be a Blu-ray option! 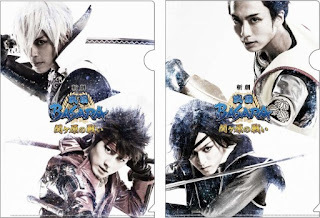 The Blu-ray version will cost ¥7,800 while the double DVD set will be ¥6,800 before tax. 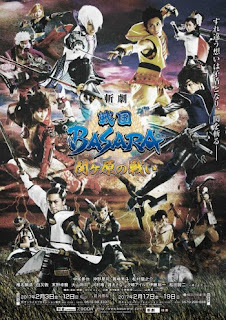 The absence of the usual stage play guests at Basara Matsuri has a very simple explanation: the new stage play has just begun its run. 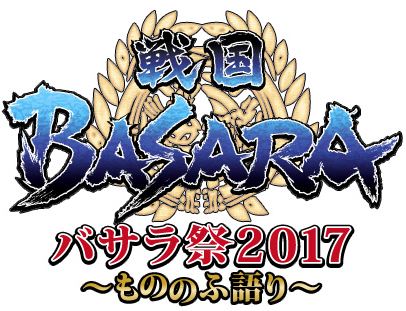 Zangeki Sengoku Basara: The Battle Of Sekigahara is being performed from 3rd February to 12th February 2017 in Tokyo then moving to Osaka for the shows from 17th February to 19th February 2017. 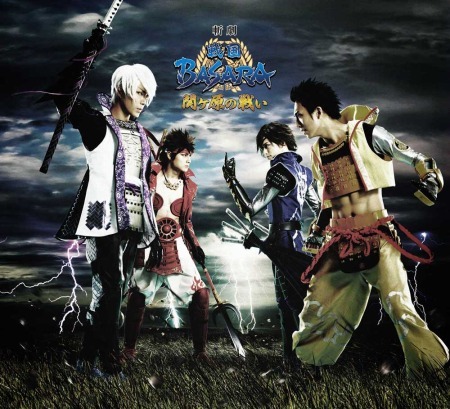 There are a number of special treats lined up for attendees, such as a live performance of the series' anniversary theme song by band SOLIDEMO after Sunday's show and cast appearances from seiyuu Miki Shinichirou (Matabee), Ishino Ryuuzou (Motochika) and Ookawa Tooru (Ieyasu) on certain dates. I'm interested in the new actors, especially since most of the leads have been replaced, but I'm also interested to see how well Naotora survives the transition to live action. It's good to see her appearing at last. There are also some special appearances by characters who aren't part of the main play for a few of the shows, where they'll have extra scenes exclusive to those performances! Kotani Yoshikazu (Mouri Motonari), Inoue Masahiro (Katakura Kojuurou), Saitou Shuusuke (Shima Sakon), Nakayama Yuuki from SOLIDEMO (Hisahiko) and Yamaguchi Tomoya from SOLIDEMO (Takezou) will appear on certain dates, and in some cases they'll come back on stage for an 'after talk' chat after the finale. I hope that these extra scenes make it to the DVD so everyone can enjoy them. In the meantime, we will have to make do with the early reports from news sites such as 4Gamer, Famitsu, Gamer, iLIP and Stage Natalie, as well as this illustrated version. A new stage play means new merchandise, and this one is no different in that respect. 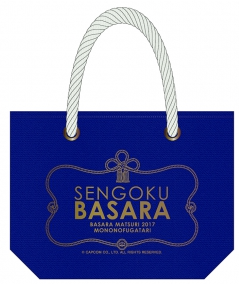 As well as a food and drink tie-in at the Karaoke Pasela store in Shinjuku, fans who go to see a live performance can purchase the following goods at the venue. On the topic of the stage plays, Lumi noted that fans are no longer being forced to order the DVD versions through the Japan-only Ace Store, as Amazon Japan now lists Butai Sengoku Basara 4 for direct purchase. 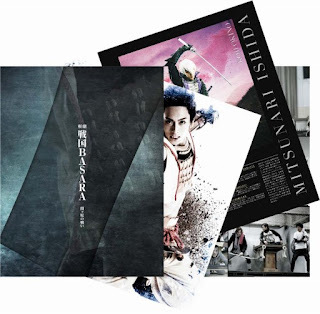 This is a much more convenient (and less costly) way for fans outside Japan to support the stage play series. Let's hope that the new play DVDs will eventually begin arriving on Amazon in a timely manner! Three new B2 tapestries (wall scrolls) will be released on 27th March 2017 with illustrations by Sengoku Basara 4 manga artist Yoshihara Motoki. 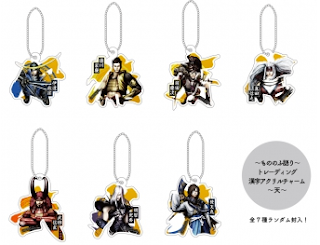 The designs were originally sold as exclusives in three Japanese regions but have now been made widely available within Japan on the Dengekiya store and Amazon Japan: Masamune/Kojuurou (Sendai), Yukimura/Sasuke (Nagano) and Mitsunari/Sakon (Kinki). 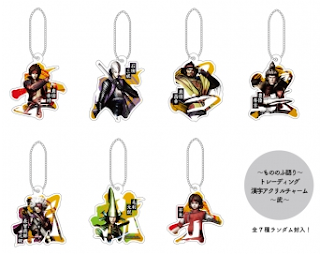 The Sengoku Basara series will be returning to monthly manga anthology magazine Dengeki Maoh this spring with a series of three all-new Sengoku Basara Retsuden manga focusing on specific characters from the Sengoku Basara universe. 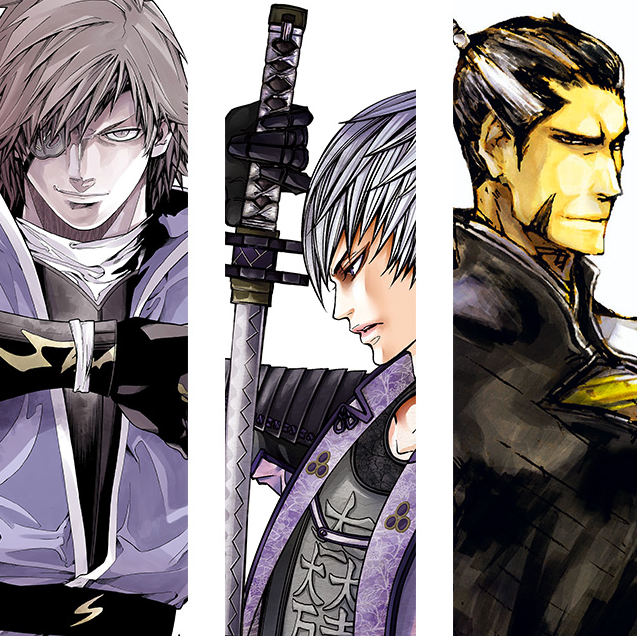 The first of the new stories will be drawn by Sengoku Basara 4 artist Yoshihara Motoki, and it will be about Date Masamune. It will be followed by a story about Ishida Mitsunari from Sengoku Basara 3 -ROAR OF DRAGON- artist Ooga Asagi, then finally there will be a story focusing on Matsunaga Hisahide from frequent collaborator Tsutsumi Yoshisada. All three artists have worked on the series in the past so it's good to see them returning with this new project. In addition, Capcom's Yamamoto Makoto will be overseeing all three of the new manga so we can expect to see his input in the brand new stories. The alternate universe Sengoku Basara DOKUGAN manga is already up to its second collected volume, which will be released on 17th March 2017 under Akita's Young Champion Comics label for ¥562 before tax. It will be widely available from all good import bookstores as usual. 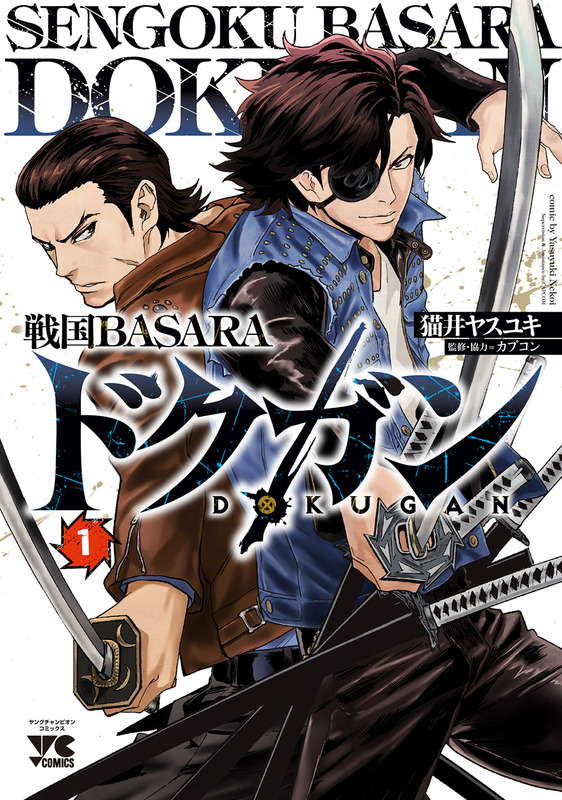 Speaking of Sengoku Basara DOKUGAN, I never had the chance to show off the cover artwork for the first volume which went on sale last October! Here it is. The Sengoku Basara Complete Best 2011-2016 CD is a limited edition release which came out (AmiAmi) on 30th November 2016 for ¥3,000 before tax. The CD will only remain in print until March 2017. 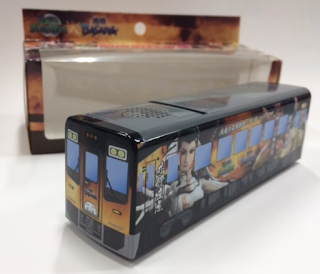 To avoid my computer exploding from including too many images in this post, I'll recap some of the more commonplace new merchandise more briefly. 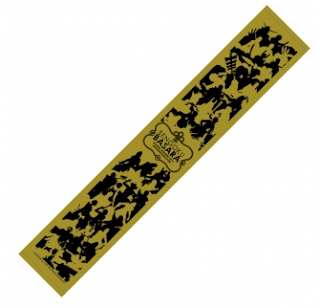 There have been several new types of merchandise released in Japan over the winter, ranging from Sanada Yukimura-den metal straps to paid in-app decorations for ubiquitous transport planning app NAVITIME. 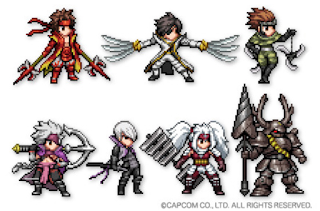 The Capcom x B-Side Label sticker collaboration continued with additional designs for Yukimura, Masamune, Benmaru, Bontenmaru, Masayuki and Nobuyuki. 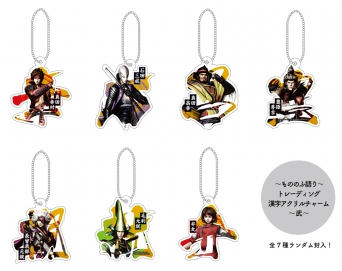 It's odd that Naotora is included in the magnet and bookmark roster as one of the main characters, partly because merchandise for female Sengoku Basara characters is rare in general and partly because she has very little to do with the game the merchandise relates to in the first place! A preemptive sign that there were plans to boost her popularity to tie in with this year's taiga drama in Japan? The Capcom Cafe has updated its menu to add new dishes. 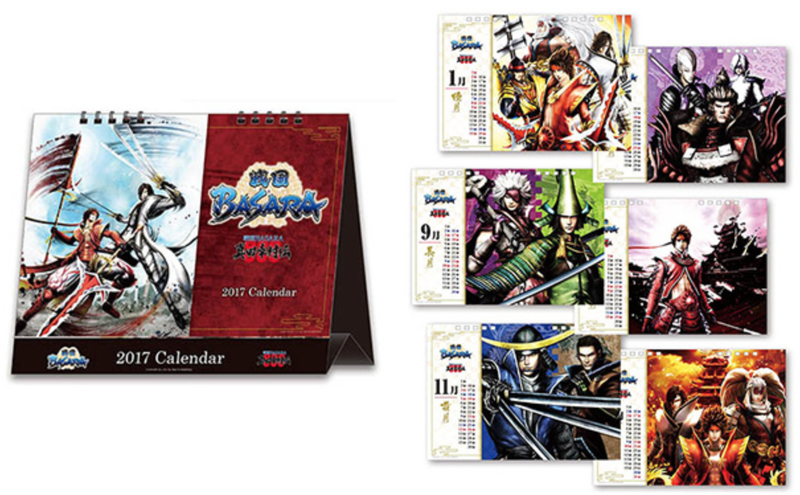 Lastly, Japan-only official merchandise store e-Capcom has also been offering a unique ¥2,130 calendar which collects some of the quirky illustrations that Itou Ryuu has been creating for the Sengoku Basara LINE account. The account has continued to send strange new pictures to its subscribers on a regular basis, so it would be nice to see them all collected into an art book eventually. 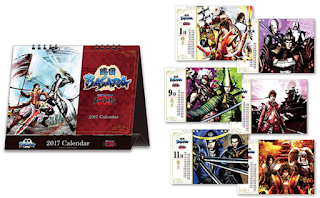 Until then, this calendar is the only way to have a high quality physical copy of those illustrations. Preorders close on 8th February 2017 with delivery estimated for 10th March 2017. 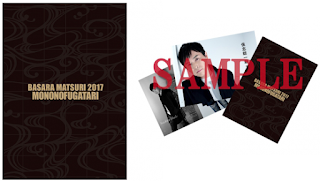 The calendar starts in April and runs for twelve months, so including the cover there are thirteen images included in total. For those of us who can't afford the calendar via a deputy service, following the official LINE account is a free alternative with images like this appearing on a regular basis. While I wasn't updating, we've had collaborations with Hacka Doll, and mobile game Senran No Samurai Kingdom. 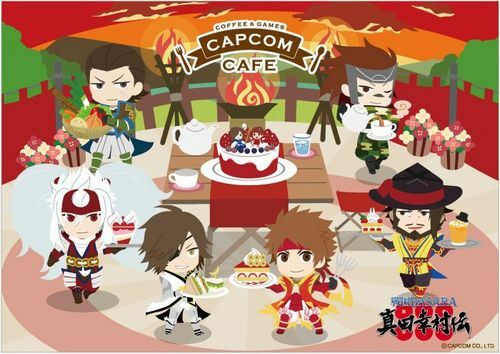 We have had a Yukimura-themed tour running alongside the promotions at the Tokyo Game Show, and the Sweets Paradise Sanada Cafe relocated for another campaign. The Bali Tower hotel in Tennouji (Osaka) is letting guests stay in special Sengoku Basara Yukimura or Masamune themed rooms up until 28th February 2017, and gorgeous Christmas cupcakes and macarons were made available across Japan by mail order through Priroll. 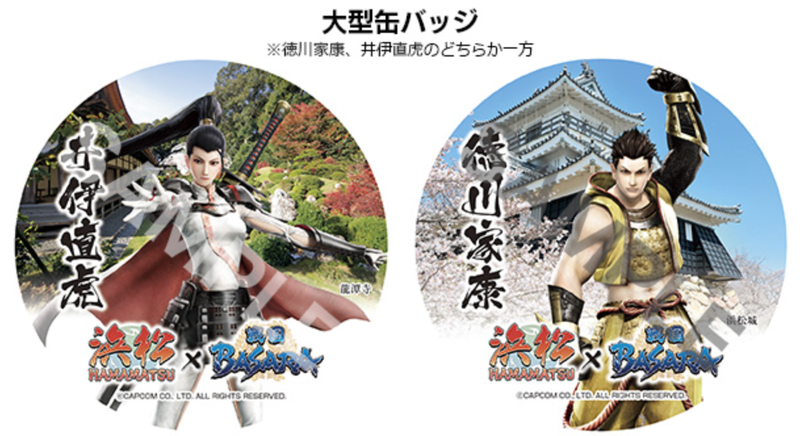 Meanwhile, there is currently a major real world campaign heavily featuring Ii Naotora (along with Ieyasu) to capitalise on the increased interest she's expected to be receiving in Japan throughout 2017. The main purpose of the campaign is promote tourism in Hamamatsu, Shizuoka, a region with strong historical ties to the Sengoku period. 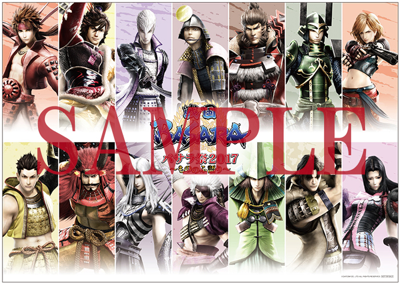 A full announcement is available in English already courtesy of Capcom and the Japanese website for the promotion shows off the various attractions, from the standees used in the stamp rally to the stunning Sengoku Basara train decorations. 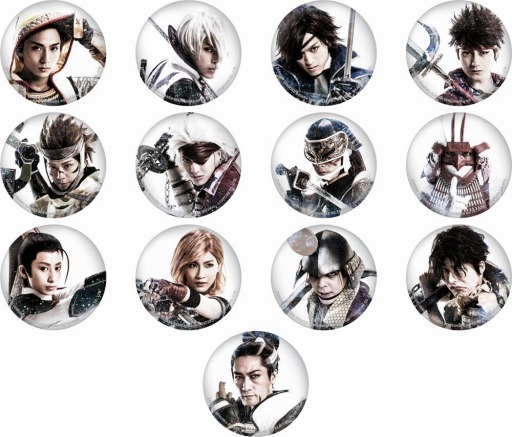 The free Sengoku Hamamatsu Stamp Rally smartphone application is available for iOS and Android devices and lets visitors unlock digital wallpapers and frames. You can also earn exclusive merchandise by travelling around the Hamamatsu area. 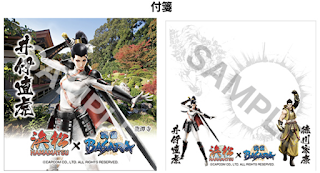 There are also additional benefits to travelling around the Shizuoka area, with the Tenryuu Hamanako Railroad x Sengoku Basara campaign offering exclusive Naotora-themed ticket designs, smartphone cases and collectable model trains for its customers to buy. I would love to get my hands on that little train! 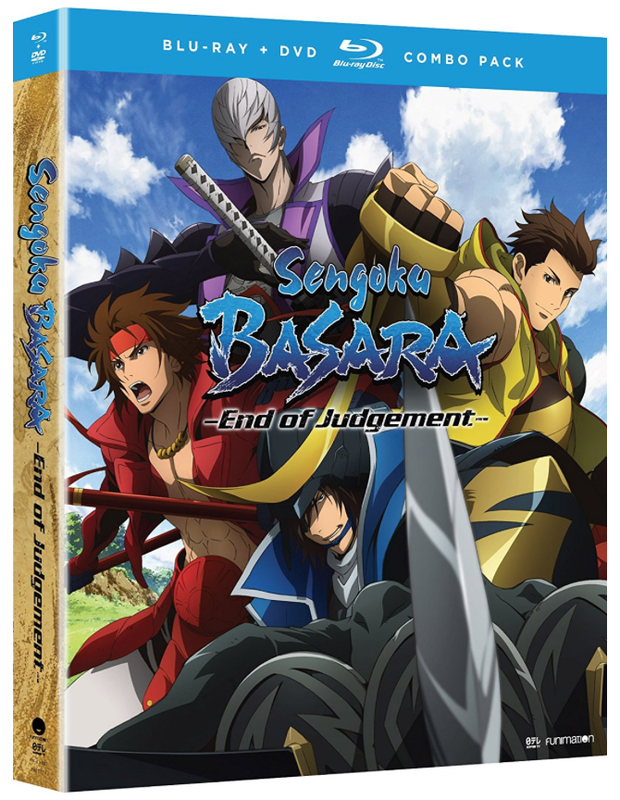 Funimation have finally released (RightStuf link) the 2014 spin-off anime Sengoku Basara: Judge End under its official US title Sengoku Basara: End Of Judgement on 27th December 2016. It's a DVD/Blu-Ray combo pack priced at $64.98 SRP; with online discounts it can usually be found around the $40 mark before shipping. I doubt a UK license is imminent - Manga UK reported that the previous Production I.G. anime sold poorly here and they actively avoid licensing titles popular with women (! ), so it all depends on whether Funimation and Anime Limited decide to relaunch the series in the UK themselves. Given that Judge End isn't all that popular even amongst fans, I decided not to wait and picked up a copy of the US set for my collection. I'll try to write a comparison with the Japanese discs when there is time. 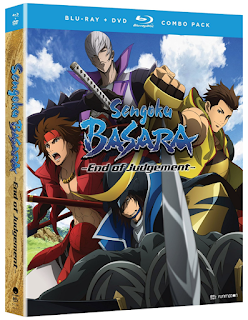 To accompany the release of Judge End, Funimation has also rereleased the previous anime at a rock bottom price in its S.A.V.E. range. You can get both seasons of the Production I.G. anime television series (including the OAV episodes and extras) bundled together on Blu-Ray and DVD for under $25 which is an amazing deal. The rerelease of the movie is priced similarly. S.A.V.E. 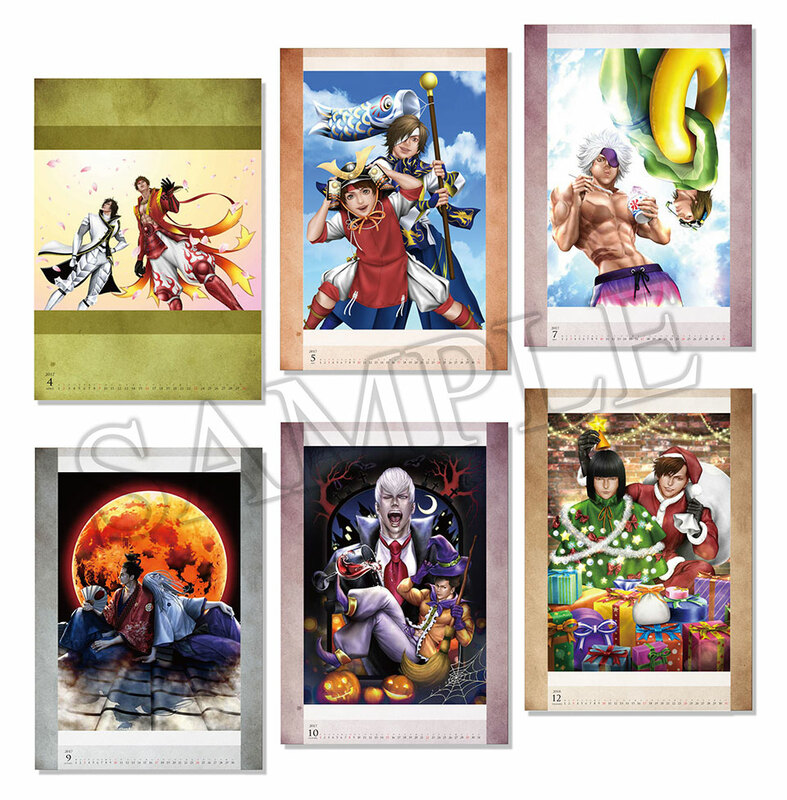 releases usually come towards the end of a product's life cycle before the series goes out of print entirely, so if you have been waiting before picking up a copy of the anime this rerelease might be your last chance. 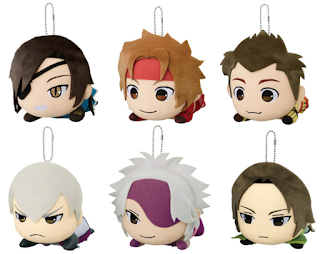 Whew, writing all of this took so long that it's already Basara Matsuri day in Japan! I'm praying that we get some good news. It has been a long time! In Facebook I have been seeing Sengoku BASARA news, but all this time I was wondering when would update your news. 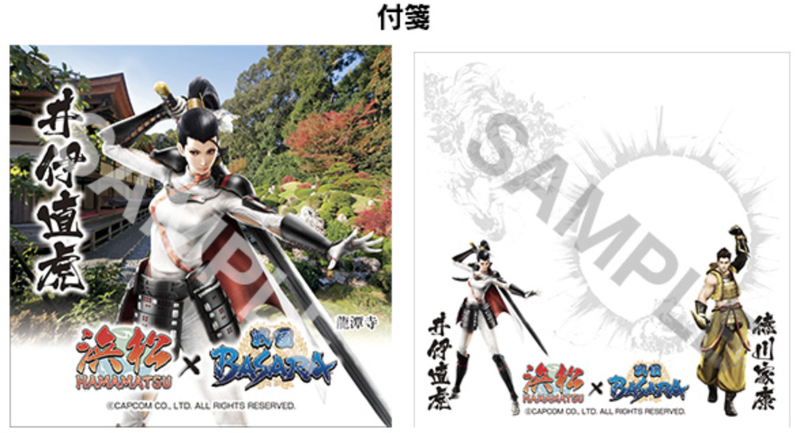 Yeah, it seems because of the new Taiga Dorama about Naotora, last campaigns are about her. The toy train is cute! 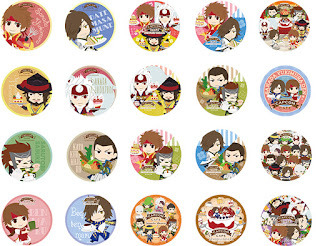 By the way, do you know how well did Sanada Yukimura-Den get in sales? I don't know if it went good or bad for the first Retsuden series game. 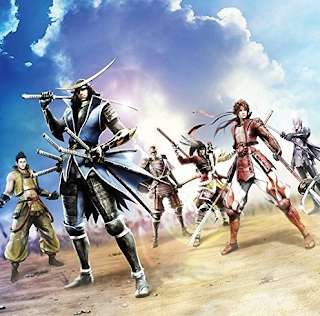 Some people complains about the lack of stages and two players mode, but others have been praising his new gameplay mechanics (the bushin system and style system instead of the old item system) and new characters, as well as Yukimura's and Masamune's new movesets; and for me, although I don't have even a console, I have been seeing gameplays in YouTube while focusing on the story (translating some dialogs are difficult since it's definitely non-standard japanese), and until now, for me it's the best story ever told in Sengoku BASARA's series, especially for the development in Yukimura character and his rivality with Masamune, as well the mischievous Masayuki (I love this one, it contrast in an interesting way Shingen's job as a mentor for Yukimura) and the stern Nobuyuki (how did you betrayed your father and Yukimura in that way, why!? ), and depicting Ieyasu not this time in a positive light as before (I personally dislike a lot historical Ieyasu for the way he took power), and getting INCREDIBLY scolded by Yukimura in chapter 10. Anyway, good to see you here again!